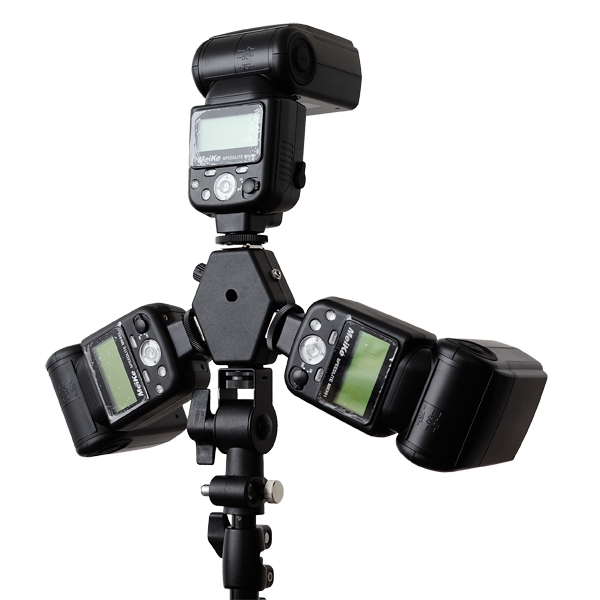 The Cheetah Tri-Speed H120 is a triple flash bracket with a 3.5mm socket to plug in a radio receiver or sync cable and trigger all three flashes simultaneously. Any good? Read our review to find out. Need more light? Getting a great big beefing studio head is not always the best solution. Chances are, you spend the majority of your time using small flashes on location and only need to break out the big guns for certain situations, such as large group photos, architectural work or some other specialist application. In this case, it helps to have a modular set-up, rather than having a whopping studio flash (and all the accessories needed to support and power it) taking up space in your kit bag and studio. 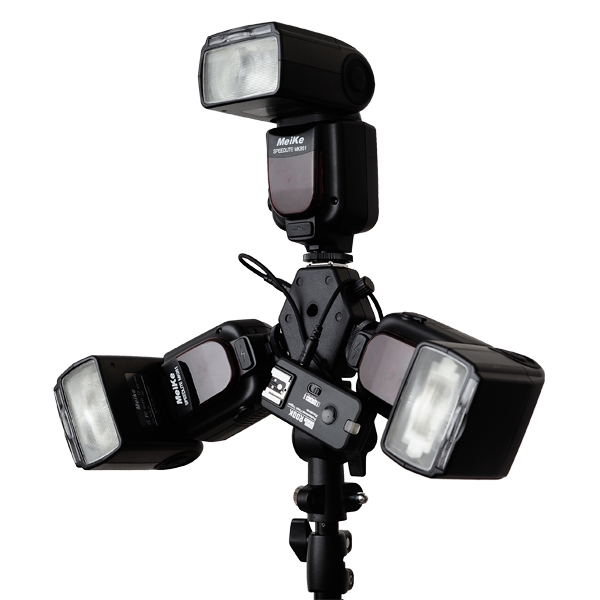 So then, time to gang up your speedlights. That is, put together a group of hotshoe flashguns to combine their power, then break the apparatus down into its constituent parts for easy transport, storage and use in a variety of other photographic lighting scenarios. By turning each light down a notch or two, you may also effectively put out the same power as a smaller unit but with faster recycle times. 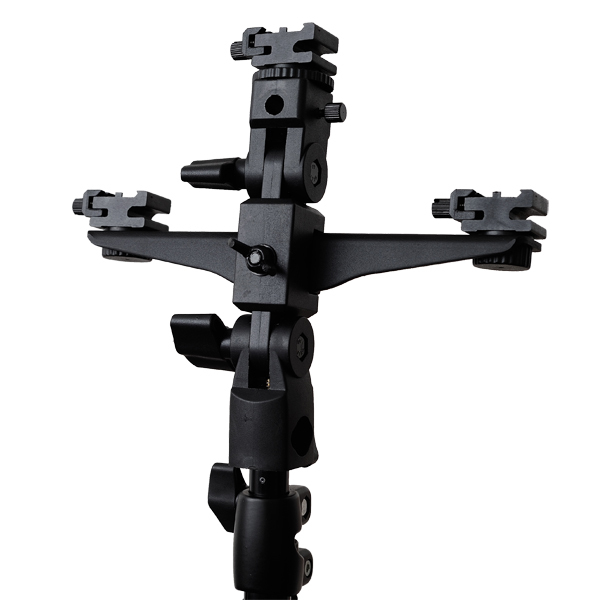 The Cheetah Tri-Speed H120 is a flash bracket sold by CheetahStand and UKphotodistro. 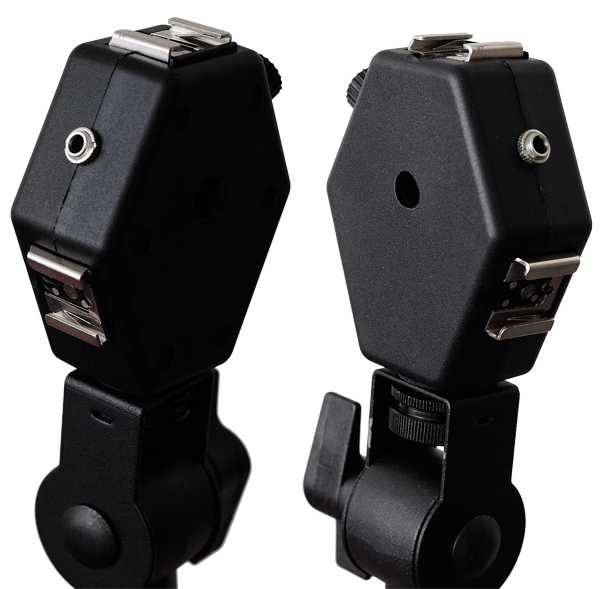 It holds up to three common hotshoe flashguns and has a 3.5mm socket that lets you plug in a radio receiver or sync cable to trigger all three flashes simultaneously. Contrast this with the Quantuum BK-6, which has no such clever circuitry, the BK-6 being just a solid chunk of metal with some cold-shoes welded on. One of my gripes with such brackets is that you have to attach three separate radio receivers — you can’t just trigger one and optically slave the others, especially outdoors or in large spaces: I’ve tried it and it doesn’t work. Thus with a cold-shoe-style bracket you have to buy three compatible radio receivers, make sure they’ve all got charged batteries, make sure they’re all on the same channel, make sure they’re all in the same group, make sure each one is securely attached to the bracket, then make sure each speedlight is firmly secured to the receiver and carry the whole heavy rig around, making sure it doesn’t fall apart (and it will, but my old-fashioned speedlights have thankfully proven to be quite shockproof). The Cheetah TS-H120 gets rid of these gripes, thanks to its built-in sync port. At US$50 (£30) it’s a cost-effective solution, already saving you money on all those extra radio receivers, splitter cables and batteries, not to mention sparing you hassle and worry. There is a 1/4-inch threaded socket on the bottom of the TS-H120 so it fits on any tripod, most light stands and swivel brackets. An umbrella hole goes through the centre and there is a little tightening screw to keep lighting umbrellas (or umbrella-style softboxes) securely in place. Despite being made of plastic (c.f. solid metal Quantuum) the Tri-Speed bracket does not creak and feels up to the task. The hot-shoes don’t have tightening clamps but they do have locking pin holes: once the locking pin (found on all modern flashguns) sinks into this little hole, the flashgun isn’t going anywhere. The flashes sit in a Y-pattern, which I much prefer to the T-shaped configuration found on the more expensive Lastolite TriFlash Sync and some generic eBay adapters (below). The T-shape style bracket above is fine if you are using the flashes bare (without light modifiers) for some raw power outdoors, but is problematic if you were intending to put the apparatus in an umbrella or softbox. Basically, all the light is going above the axis of the centre of the bracket, so only the top half of your umbrella/softbox will be lit up and the lower half will be relatively dark. If the reason you got a triple flash bracket in the first place was to light up something big like a ‘parabolic’ umbrella, using a T-shaped one is counter-productive. Another style of flash bracket is the one above, made by DSLRkit. It is quite sturdy and ostensibly a decent choice if you want your flashes all pointing the same way, but the light distribution pattern is even worse, the shape does not transport or store efficiently and if you disassemble the bracket it breaks down into lots of odd small pieces. Plus, with each flash mounted side-by-side it is tricky to get access to the battery compartments, sync sockets and so on. 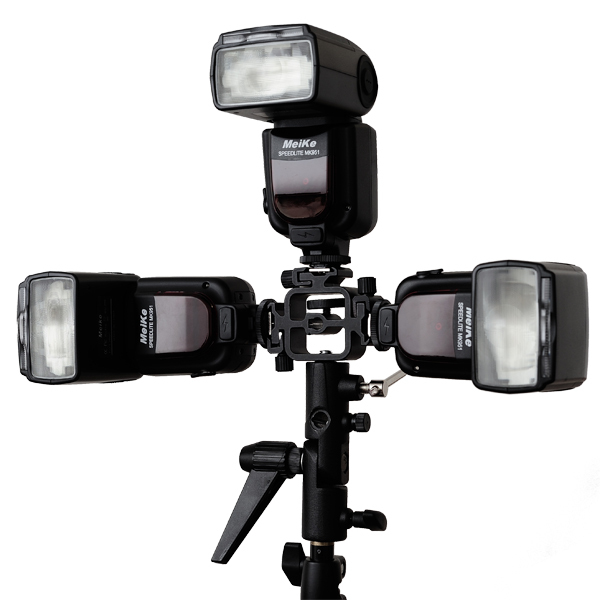 The picture below shows my Tri-Speed H120 holding a Hylow umbrella softbox — a generic Apollo Orb clone. It has no trouble holding the softbox and the configuration gives one of the most even light spreads I have seen, short of using a dedicated bare-tube studio head. 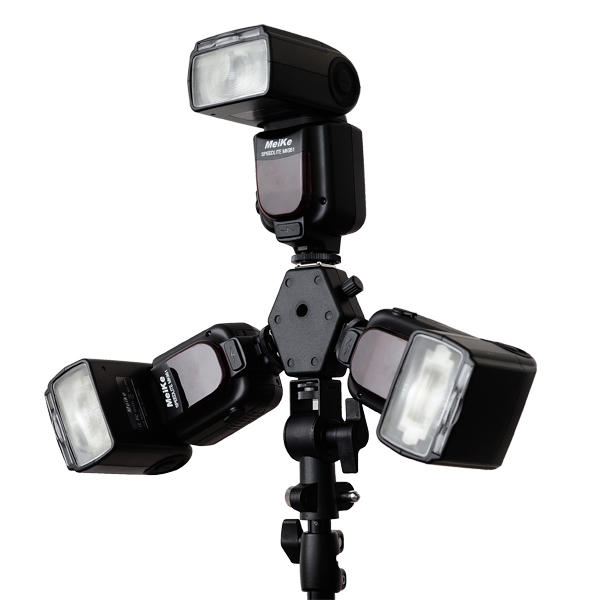 Flipping down the wide-angle diffuser panels on each flashgun seems to fill softboxes and umbrellas best. 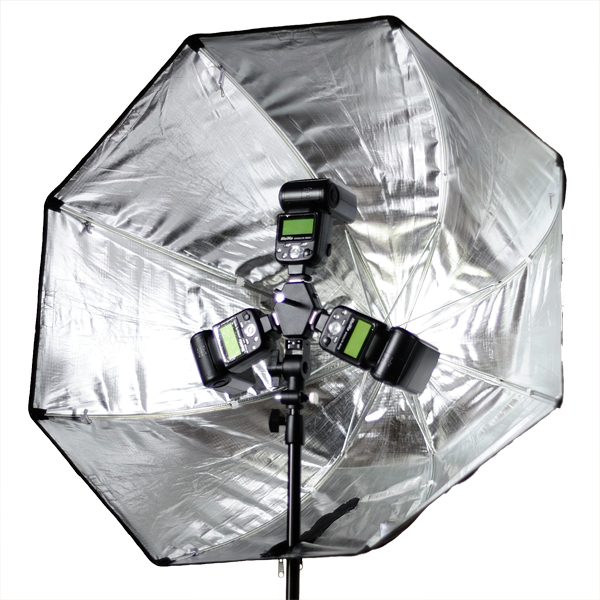 The Cheetah Tri-Speed H120 is a great choice for anybody needing to get more, bigger light from one position. Three flashes gives you one-and-a-half stops more light than one on its own (or the same amount of light with faster recycle times), beyond which point you might want to look into getting a professional location monolight or pack-and-head lighting system, since running six or more speedlights at once could be more trouble than it is worth. At $50 (£30) the TS-H120 is the best value multi-speedlight bracket I can think of — around the same price as sync-less eBay brackets and much cheaper than the Lastolite TriFlash Sync — while giving the most even light distribution and coming with excellent customer service from CheetahStand in the USA or UKphotodistro in Blighty. Do you like to gang flashguns together or do you prefer a brighter flash system? Is one speedlight enough power for you? Share your feedback below.